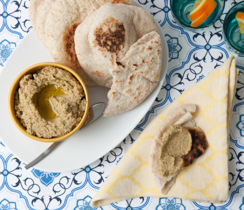 Make and freeze batches of pita ahead of time. 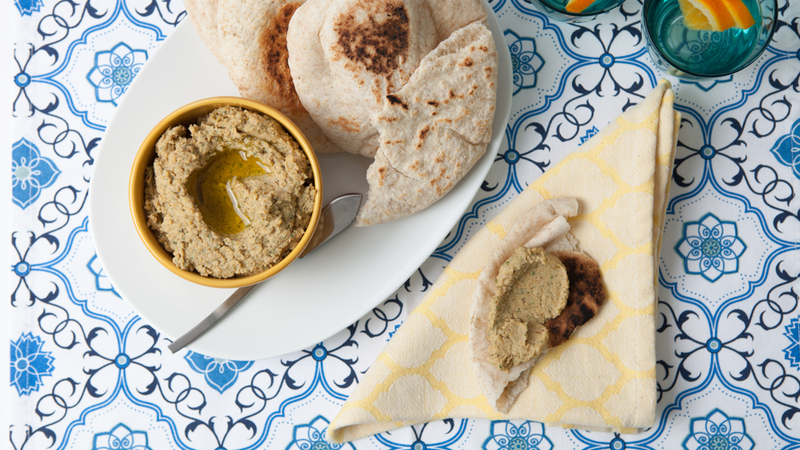 Re-warm later in the oven or on the grill and serve with our Roasted Garlic Hummus. Activate the yeast by mixing it with 1/4 cup (60 ml) of warm (not hot) water and 1 tsp (5 ml) of sugar. Set aside the mixture until it's frothy, about 5–10 minutes. 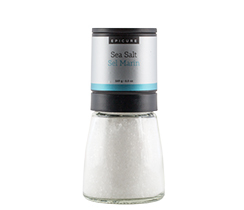 Blend the flours, Roasted Garlic Hummus Mix, remaining sugar Sea Salt, and in a mixing bowl. Add the yeast mixture, oil, and remaining water, and mix to form a dough. The dough should be soft but not sticky. If it's too sticky to work with, add a little flour, 1 Tbsp (15 ml) at a time. (Remember the dough will absorb a bit more flour if you knead it by hand.) If the dough feels a bit stiff, work in additional water, 1 Tbsp at a time. Knead the dough in a mixer with a dough hook, or by hand on a lightly floured surface, about 10 minutes or until smooth and elastic. Divide the dough into smooth balls and leave them to rest, covered, on a lightly floured surface for about 10 minutes. Roll out each ball into a thin circle, about 1/8” thick. Set the rolled-out dough on a clean, dry towel and cover. Leave to rise for about 1–1 ½ hours. Preheat a very lightly oiled cast iron skillet or non-stick pan over medium heat. Cook the Batbout, turning several times, until golden-brown on both sides. The browning will be a bit uneven since the bread puffs up as it cooks, and that's okay. Transfer the cooked Batbout to a rack to cool. It's okay to stack them while they're warm. Tip: Batbout will keep fresh for two days at room temperature. They freeze well, and can be heated in a microwave directly from the freezer. Just be careful not to overheat them or they'll dry out.